Welcome to Los Angeles Rive Gauche! 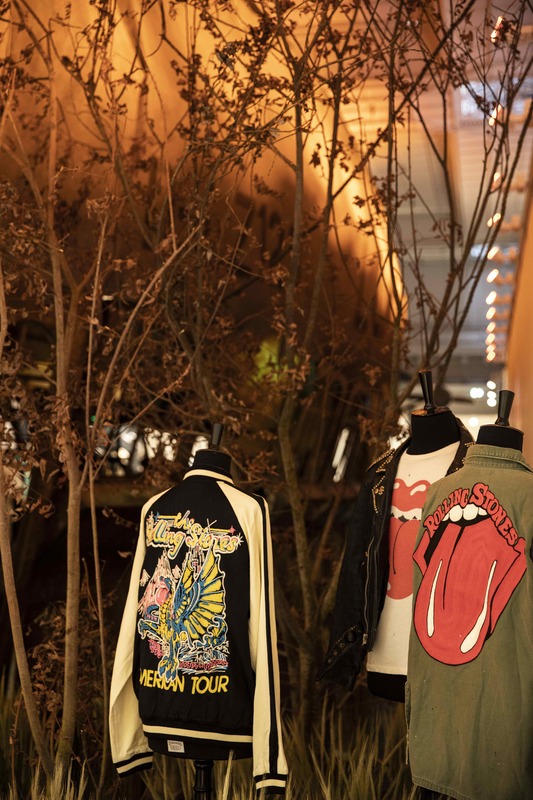 The new exhibition at Le Bon Marché Rive Gauche celebrates the Californian sun through three thematic spaces presented on all floors of the store: Sunrise, Sunlight and Sunset. Los Angeles is the early morning good vibrations, between meditation, spirituality and well-being. Day time, the sun at the zenith calls for outdoor activities: skateboarding, surfing, cycling … But Los Angeles is also the setting sun magic hour that brings the rock and glam spirit of Hollywood. 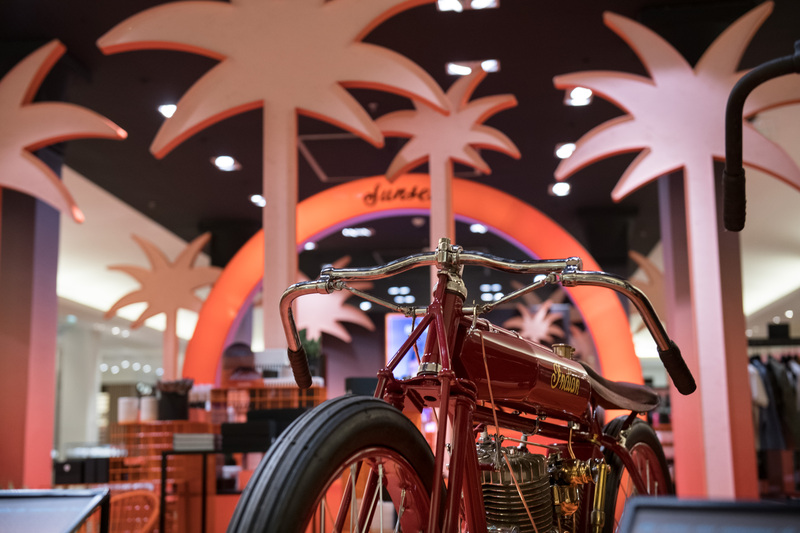 On the ground floor of the Bon Marché Rive Gauche, in the Sunset area, the engines of the big-cylinder bikes are roaring and black becomes a color again. 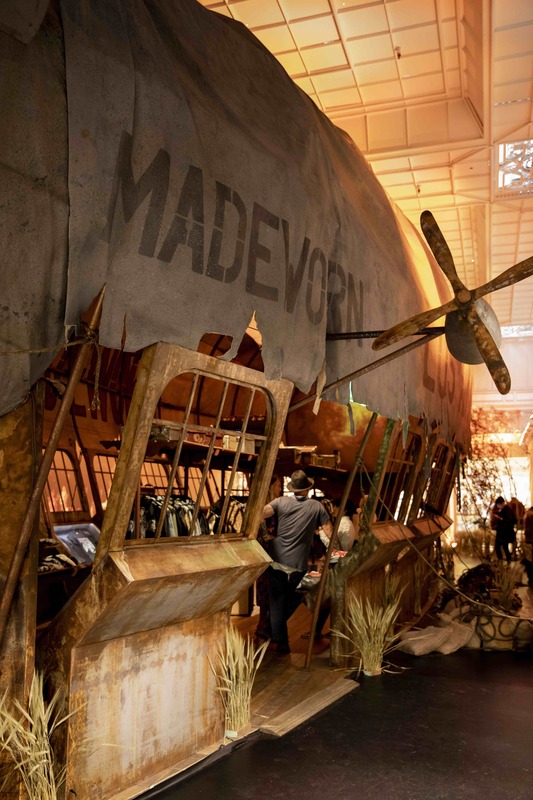 On the second floor, artist Blaine Halvorson was invited by the store to celebrate rock’n’roll, by creating an immersive concept store: an old Zeppelin, who after crossing the Atlantic, docked in the middle of a fantastic fauna and flora. 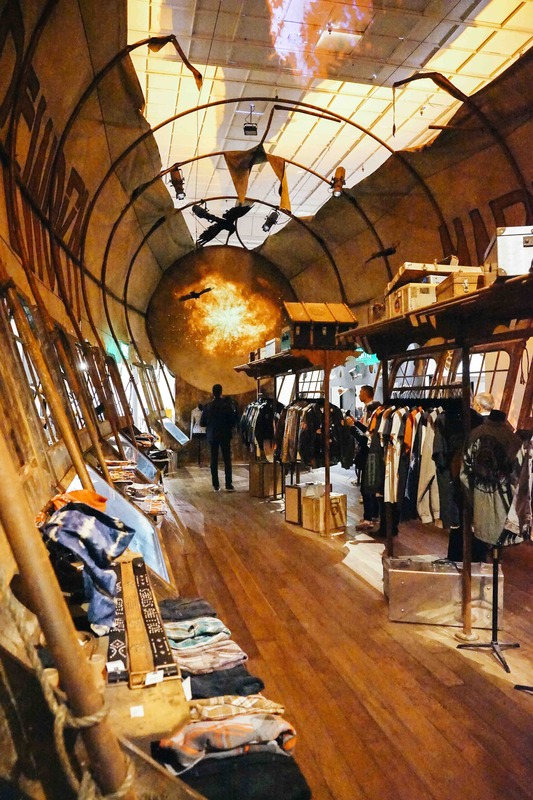 Inside, Blaine exhibits parts of his Californian brand MadeWorn. Leather jackets, weathered jeans, hand-aged hats, but especially his collection of vintage concert t-shirts. Blaine has been collecting them since he was 20, he now recreates them handmade in his Los Angeles boutique. 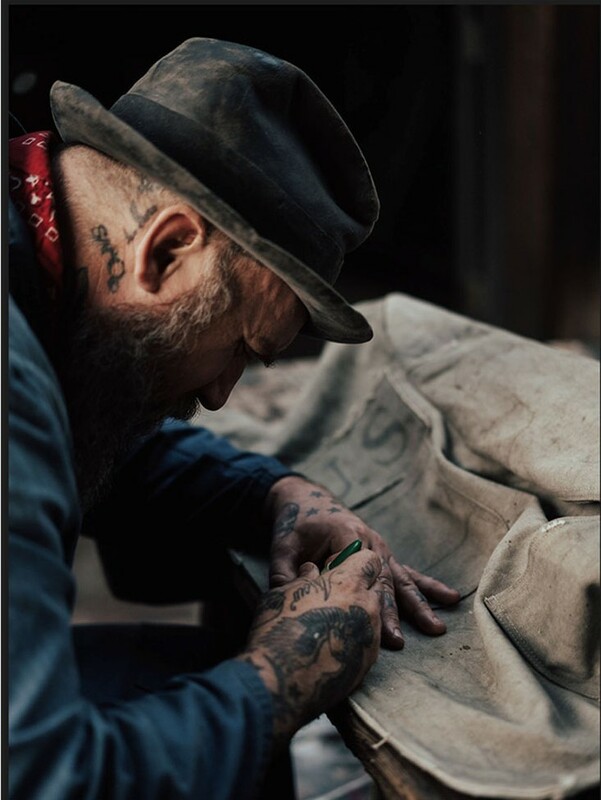 The Bon Marché Rive Gauche area hosts another distinguished guest: Los Angeles flagship tattoo artist, Dr. Woo. The artist has won the admiration of tattoo enthusiasts with his singular style that combines fine lines, geometry and dreamlike universe. He settles down in Paris for an exclusive tattoo session at Bon Marché Rive Gauche from September 25 to October 2 (by appointment only). Dr. 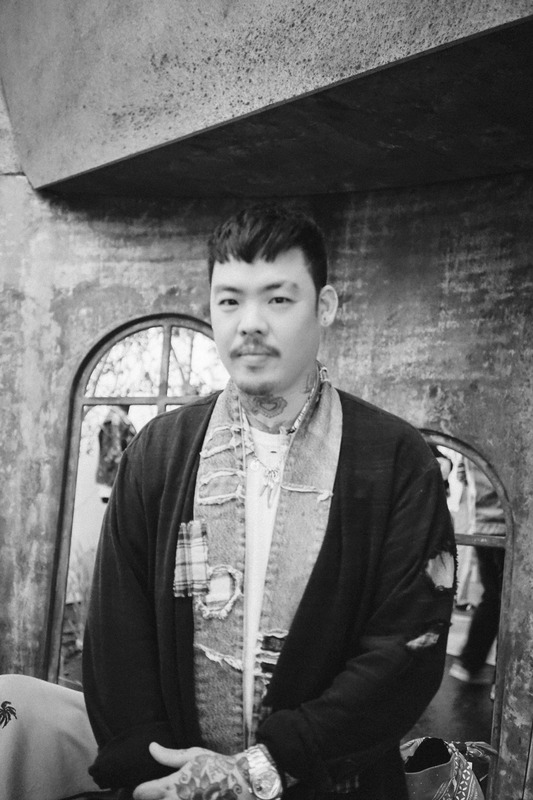 Woo also presents, for the first time, his own brand of jewelry and ready-to-wear. 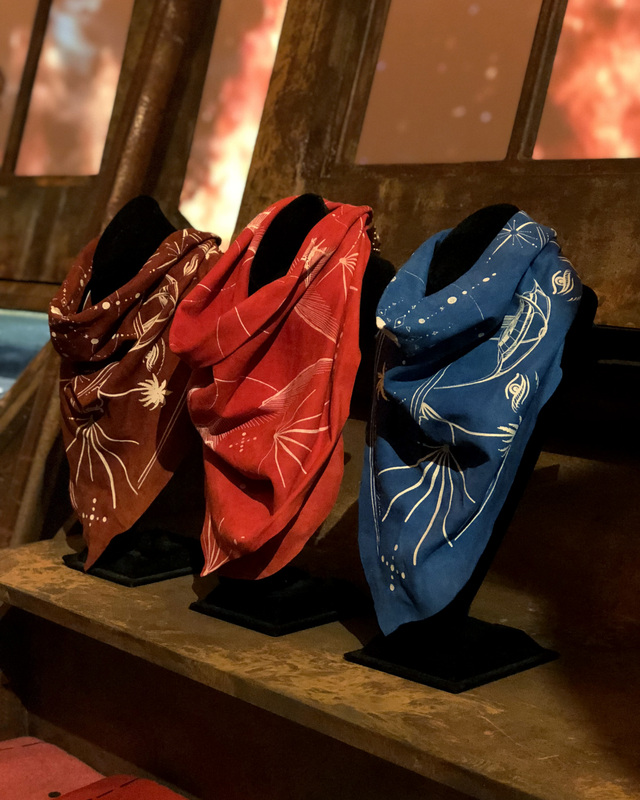 It is in this context that he has created a capsule collection of accessories with Blaine Halvorson: scarves and cashmere throws inspired by the City of Angels and covered with tattoos. The exhibition Los Angeles Rive Gauche is to be discovered in Paris until October 21st.